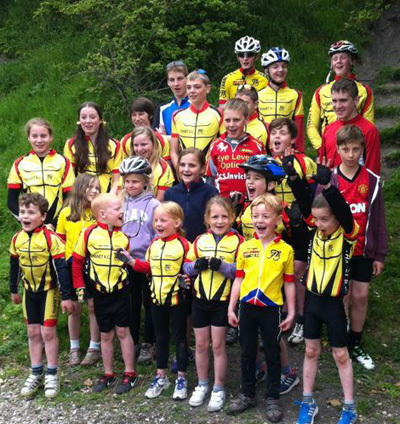 Since forming in early 2009 Thanet RC's Go Ride section has gone from strength to strength. Sessions are run under the organisation of our Head Coach, Level 3 qualified Colin Robinson, assisted by Richard Bazin, Steve Quincey, Steve Langman, Annie Davis, Teresa Childs, Helen Hill and Jo Smith (all are British Cycling Level 2 qualified coaches). Additionally, we have David Redmond, Maddie Basin, Dan Martin and Ollie Robinson (all British Cycling Level.1 qualified coaches) and a number of experienced cycling volunteers from Thanet RC. Non-members are welcome to come along to their first Go-Ride session and try it out for free. Subsequent sessions cost £2 per child, plus yearly club membership of £6 per child or £35 per family (2 adults and children U18). The youth section has grown from 1 to 80 members aged 6-16 since 2009, a third of which are girls. 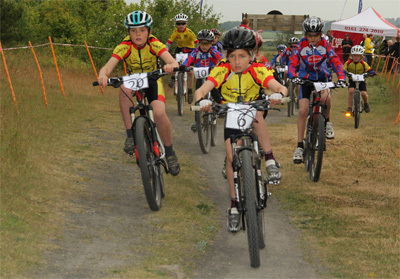 Coaching sessions and races cover the disciplines of mountain biking, road, time trials and CycloX mainly at Betteshanger Country Park (formerly Fowlmead), though also includes track riding with visits to the London Olympic Velodrome. Family rides and opportunities for youth volunteering make the club experience fun and developmental for young members. The club runs weekly Saturday coaching sessions as well as weekend races and weekday evening races, which include regional championships (see website for dates and locations). With such opportunities club riders are achieving impressive results. In 2015 four boys and one girl qualified for National Time Trial Championships and four riders took part in the National Road Race Series. With such an impressive level of performance it is no surprise that the club are currently South East Go-Ride Club Champion. 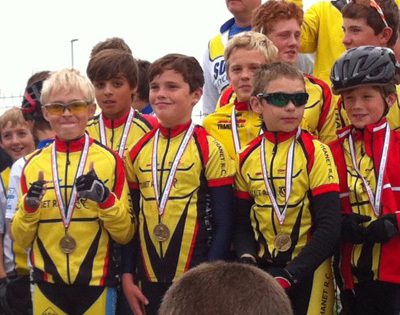 TRC young rider Ollie Robinson also represented the South-East of England in the inter-regional road cycling Youth School Games 2015. The Go Ride Saturday sessions are aimed at improving cycling skill levels using British Cycling's Gears 1,2,3 and 4 of the Go Ride Handbook, with an emphasis on simplicity. Instruction is given on all the basic cycling techniques with the goal of helping riders to become confident with their bikes. However, from our experience so far, the best part about it is that it's GREAT FUN for the riders, helpers and the mums and dads! These skills underpin almost everything that is important in cycling, whether it is for leisure or in more competitive events. Lots of our sessions employ short races, time trials and team events which are great for practicing these skills. Under British Cycling's Go Ride Racing format, we have also organised a number of race meetings ranging from grasstrack, time trials, mountain bike and circuit racing (making use of the excellent facilities at Betteshanger). The aim is to introduce younger and less-experienced riders to competitive cycle racing in a friendly, non-pressured environment. 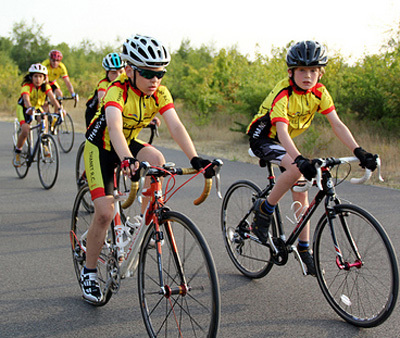 The club have also introduced a youth development team for riders aged 12-16. This is for riders competing at regional level and looking to gain extra skills and fitness levels required to perform at national level. Contact any of the coaches for more details. 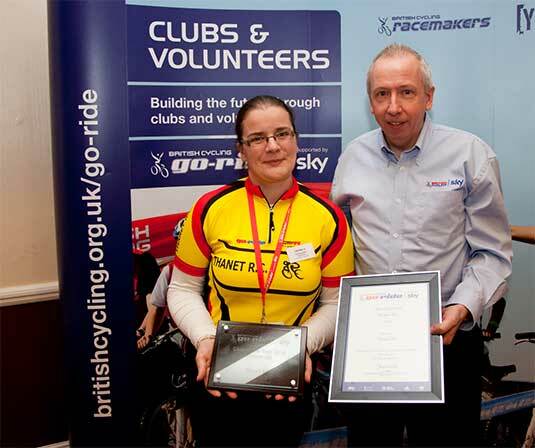 Thanet Road Club Go Ride was awarded runner-up in British Cycling’s National Award scheme. The Go Ride Club was recognised by the national sporting body for its commitment to developing young riders through coaching and racing. With over 280 clubs nationwide this is an impressive achievement.